The 24 Peaks Challenge is to climb 24 of the English Lake Districts’ Peaks, each one over 2,400 feet high, within 24 hours total walking time (over 2 days). An arduous and rewarding challenge that will give the lucky participants a fantastic two day introduction to one of England’s most popular and scenic mountain areas, The Lake District in Cumbria. Whilst some of the route follows well-defined ridges, the challenge itself is a significant and demanding high-level traverse of one of the UK’s more popular mountain ranges, and the overall distance and height gains are not to be underestimated. It is a challenge that will involve careful planning, preparation and fitness, and will appeal to both novice and hardened hill walker alike. 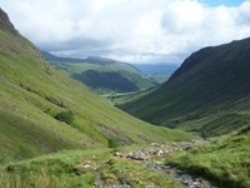 The route includes many of the more famous peaks such as Red Pike, Scafell Pike, Helvellyn and Great Gable. Teams will start very early on Day Two negotiating 10 of the peaks, before they finally descend late in the evening. Mileage covered on Day Two is around 17.5 miles. Day Three involves another long day of mountain ridges with Helvellyn being the highlight, with the mileage covered around 14 miles. The total height climbed is over 13,000 feet. Day 1 - Arrive Ambleside and book into the bunkhouse. An evening meal will be taken followed by detailed briefings on the challenge, the route and safety considerations prior to an early nights sleep. Day 2 - After an early breakfast the teams will depart at approximately 06:00 transferring to the start of the walk, beginning along the shores of ‘Buttermere’, arriving at the summit of ‘Lingmell Col’ at approximately 13:00. This is the half waypoint for Day 2. The teams will then continue trekking and collecting summits until approximately 21:00 when they will have bagged their last peak ‘Red Pike’, and then descended into Buttermere and the end of Day 2. Peaks 'Bagged' on Trek day 1 - Red Pike, High Stile, High Crag, Green Gable, Great Gable, Lingmell, Scafell Pike, Great End, Esk Pike, Bow Fell. Trek time taken usually ranges between 11 – 14 hours. Day 3 - Breakfast precedes another early start – beginning at Legburthwaite, with a full day’s trekking, leading to an anticipated finish of approximately 16:00 at ‘Kirkstone Pass’, and then into the Kirkstone Inn for a well deserved pint. Peaks 'Bagged' on Trek day 2 - Red Screes, Dove Crag, Hart Crag, Fairfield, Seat Sandal, Dollywagon Pike, Nethermost Pike, Helvellyn, Lower Man, Whiteside, Raise, Stybarrow Dodd, Watson Dodd, Great Dodd. Day 3 time taken usually ranges between 8 – 12 hours. Obviously, your start and finish times will depend on the fitness of the team members, and the prevailing weather conditions. Option to stay one more night after the event – please discuss with Adventure Café. 2 nights good quality bunkhouse accommodation. Breakfasts included. 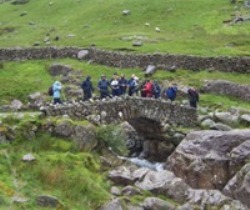 The itinerary may be operated either starting from Buttermere or from Ambleside. In some instances it is easier logistically to start from Ambleside - and return there at the end of the event. Please discuss this with Adventure Cafe. Bed & Breakfast Accommodation for 2 Nights. Transport to start of trek each day, and the final transfer back to Keswick. Transport to and from Keswick at start and finish of challenge. Lunches & Dinners. Note - Adventure Cafe will pre-reserve dinners for trekkers - as finishes can be late and you may well be incapable of ordering especially after trek day 1 ! You will receive a thorough safety briefing from your leaders. You have qualified British Mountain Leaders or International Mountain Leaders on this event with many years of leadership experience. Yoou should follow their instructions at all times and always remain in visual contact. The Lake District can suffer extreme weather conditions like most mountain ranges. Participants should ensure that they are suitably equipped to deal with both the extremes of the sun during the day and colder temperatures during the evenings and in inclement weather. They should also carry appropriate wet weather gear, and ensure that their rucksacks are suitably waterproofed.